Rhythms magazine AUS : PJ O’Brien knows how to get a Blues party started. His blistering fretwork has been turning heads from Perth to Memphis, Chicago, Austin, London, Singapore and beyond! Blues sensation PJ O’Brien knows how to get a Blues party started. His blistering fretwork has been turning heads from Perth to Memphis, Chicago, Austin, London, Singapore and back again. 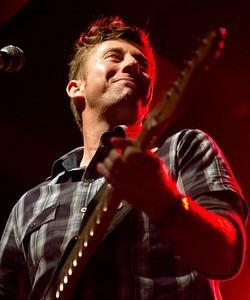 Along with frequent flyer points PJ has gathered a swag of awards including: Blues Song of the Year, WA Music Awards (WAMIs); Music Oz Blues Artist of the Year; Sydney Blues Society Performer of the Year; Best New Talent, Song of the Year and Group Of the Year ‘Chain’ Australian Blues Awards. PJ’s new album, Jefferson Blues, was released in February 2012 and debuted at No. 1 on the Australian Blues and Roots Airplay Chart. It held the top place for two months, spent the four months in the top 3 and spent 5 months in the top 10 – showing a real dedication by DJs and listeners alike. The CD has received fantastic reviews in Australia, the UK and the US and is currently receiving airplay in Australia, Europe and the United States. PJ has won numerous music awards over the years and in 2006 received an Australia Council grant to represent the Sydney Blues Society at the International Blues Challenge in Memphis TN. He has played at the major Australian Blues festivals such as Blues at Bridgetown (WA), Great Southern Blues Festival (NSW), Thredbo Blues Festival (NSW) Gympie Muster (QLD), Darling Harbour Jazz and Blues Festival (NSW), Blues on Broadbeach (QLD) Echuca Winter Blues Festival (VIC) and the Australian Blues Music Festival (NSW), as well as top Australian music venues including the Basement, The Vanguard and the Factory Theatre.